An International Journal for the Comparative Study of Law and Religion. 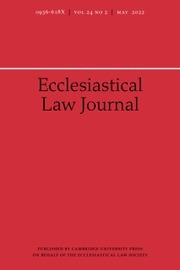 Published three times a year in association with the Ecclesiastical Law Society, the Journal publishes articles on all aspects of ecclesiastical law. Particular emphasis is given to the regulation of the Church of England and worldwide Anglican Communion, but the range of coverage includes comparative studies of the laws of other faiths and of the interface between law and religion in a global perspective. Through its regular comment section, the Ecclesiastical Law Journal provides a critical analysis of emergent trends written by distinguished scholars and practitioners in Europe and North America. The Journal also includes book reviews and summaries of recent ecclesiastical cases determined by both secular and church courts, together with a parliamentary report, a brief summary of the proceedings of national Synods, and resumés of major international conferences.